The International Road Federation Professional of the Year Award is one the most prestigious individual honors in the global road industry. The Award, which was established in 1951 and is open to both IRF members and non-members, recognizes eminent public, private and educational sector professionals who have demonstrated passion, leadership and commitment to the sector. 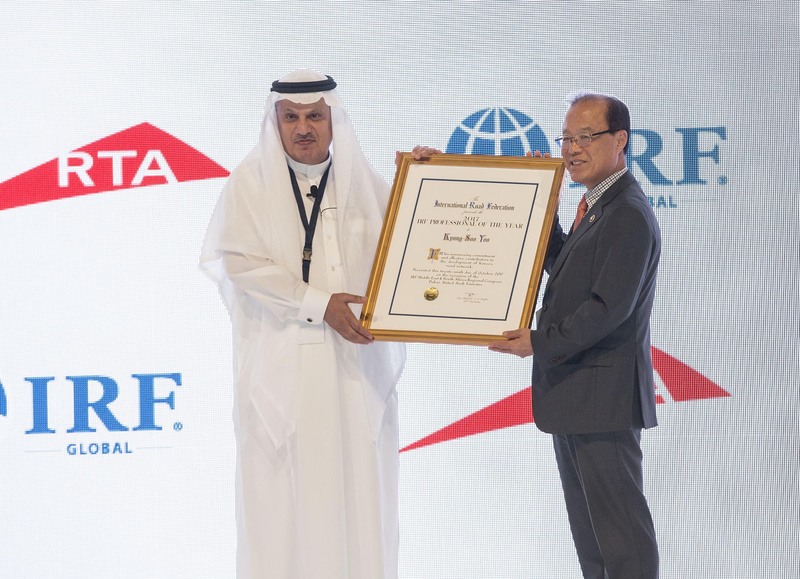 Dr. Kyung-Soo Yoo has been nominated to receive the International Road Federation's most distinguished individual honor. An IRF Fellowship Scholar, Kyung-Soo Yoo graduated from Ohio State University in 1980 before returning to the Korea Highway Corporation as a Highway & Traffic Engineer. In 2005, Dr. Yoo was appointed to run the Highway & Transportation Technology Institute affiliated to the Korea Highway Corporation. He later took on a series of leadership roles across Korean and International Associations, including the Korea Road Association, Read the full press release here. 1994 - Gordon Y S Wu | HONG KONG, CHINA S.A.R.